Find parts I and III here: Posing and Polishing. 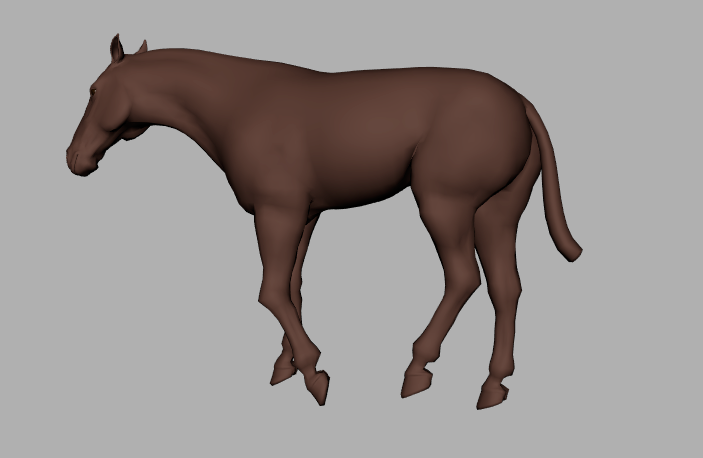 What with Christmas, applying for jobs, and so on, it’s taken me longer than I hoped to do some more work with my horse animation. Today I’ve had the chance to do so! To find my first post about this animation, click here. 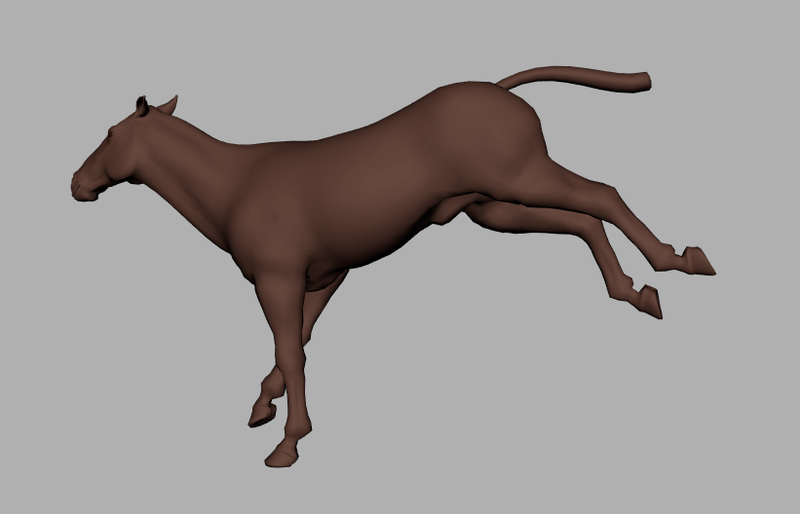 and my second pose (horse in the air) was from frame 6. I found my breakdown pose on frame 5. This is important for describing the action because it shows when the feet lift from the ground. Rather than the horse drifting upwards, it will lift up suddenly. The graph editor shows how the horse moves between keys. In the image above, the position holds until the next key: it’s stepped. This is somewhat like 2D animation (which is often shot on “twos”, or twelve frames a second; in other words, held for two frames) which I’ve found familiar and very helpful. Version 6 is the first four key frames, stepped. Version 13 is the keys and breakdowns, stepped. Version 14 is (almost) the same keys and breakdowns, splined. The next stage is to adjust the timing (getting rid of any evenness) and to polish (like fixing that wobbly knee). Find Parts II and III here: Breakdowns and Polishing. One thing I’m determined to do is to keep animating in 2D and 3D. 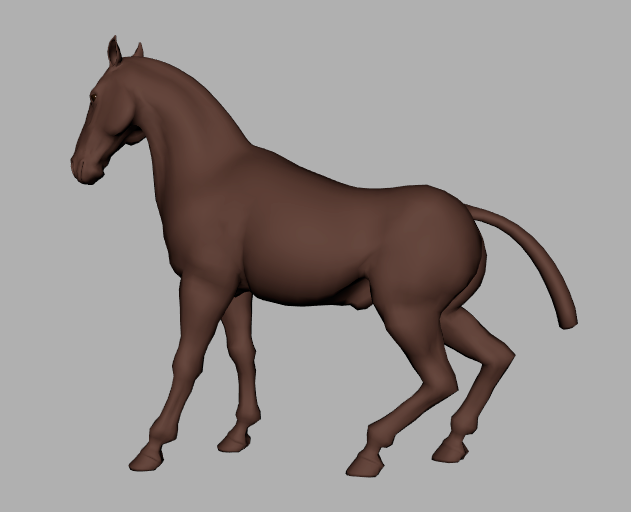 There are lots of free 3D rigs available online, so I downloaded Tomasz Jurczyk and Carlos Contreras’ horse rig from here. 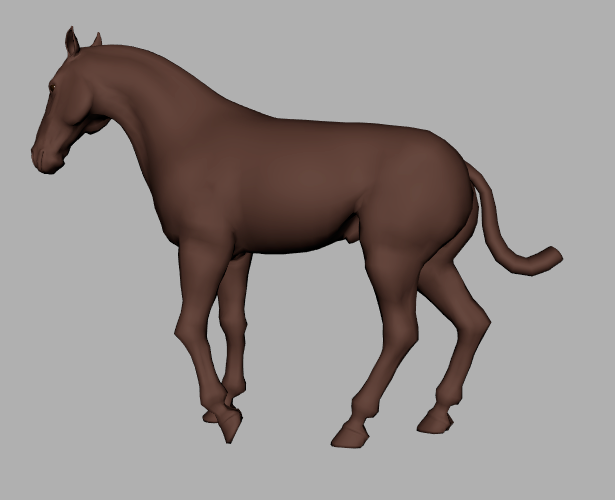 I want to add variety into my reel with some four-legged creatures. Today I found some videos of horses rearing and bouncing about. Then I sketched some quick key poses. 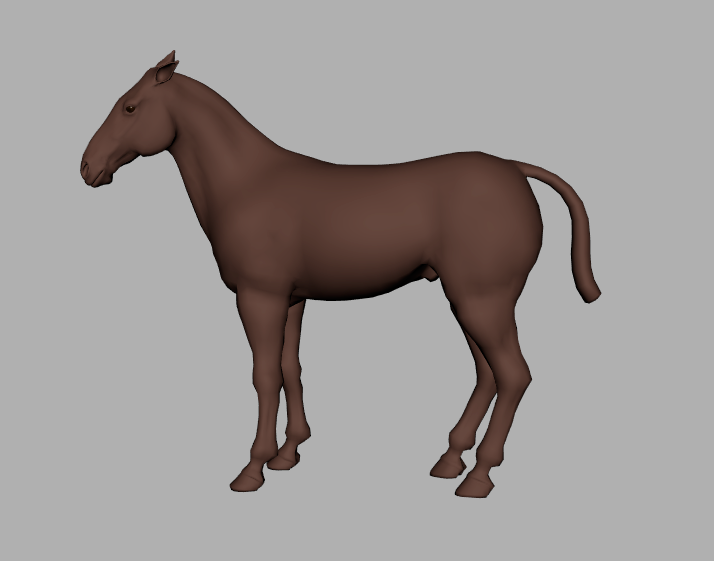 Next I opened up Maya and, after struggling for a while with the controls (I like mine to be in layers most of the time, so it usually doesn’t look like what’s below – I prefer to only look at the controls for the head, tail etc. if that’s what I’m moving) I posed out the rig using the sketches as reference. 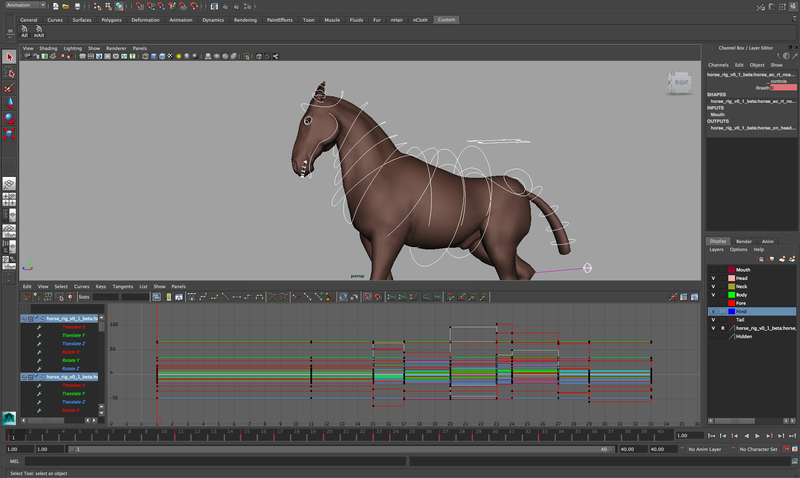 If you’re interested in learning Maya (or other software), I’d recommend starting with a simple rig. It can be a little overwhelming at first, but once you’ve learnt a couple of controls adding a few more is much easier. There are many fantastic tutorials online to learn from. 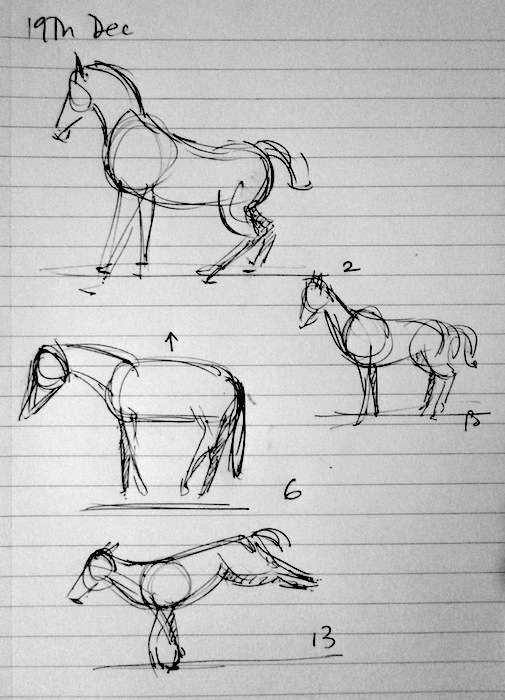 Below are the key poses for my animation – they tell the story. The horse crouches down, pushes up, kicks out, and settles to a standing pose. Though there’s an overview of what happens, there isn’t yet enough detail to show how the body moves from one pose to another. 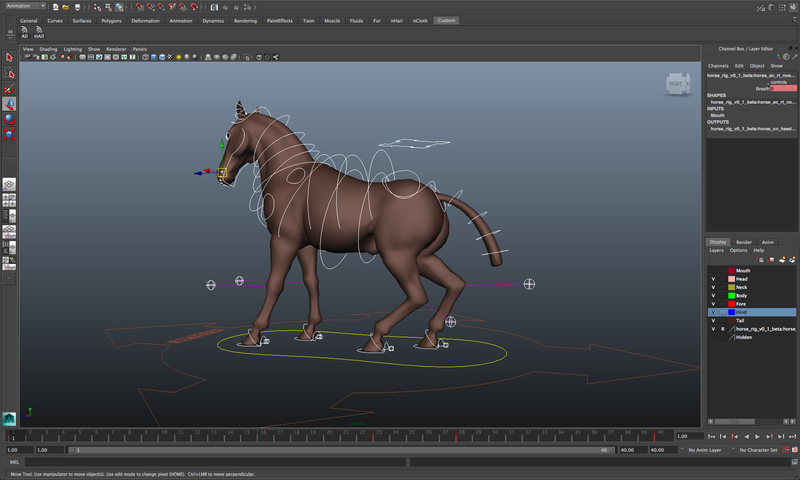 When Maya splines between these poses, the horse moves evenly between poses like a PowerPoint on a default setting. The next stage is to add breakdowns (poses between two keys that describe movement) which I’ll be working on soon. 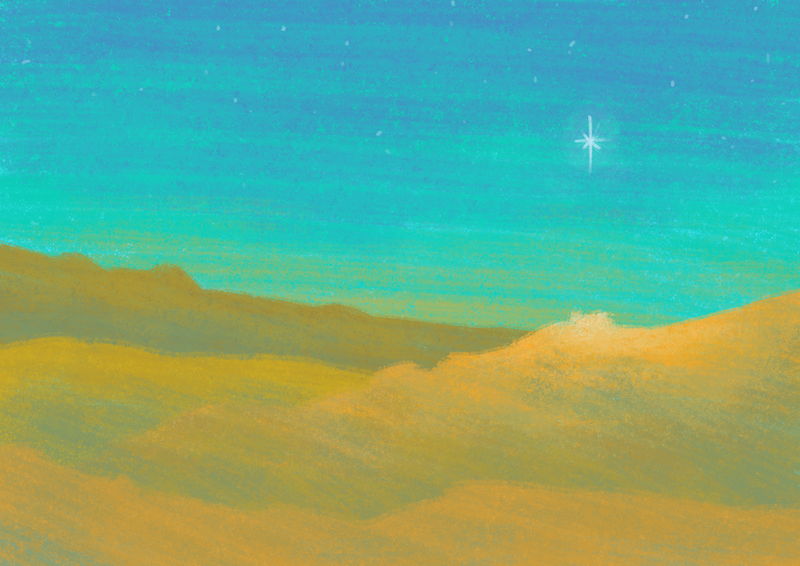 I have an idea for a short 2D animation, drawn and painted in my rough sketchy style. I drew this test one morning last week – it was great to sit down at an animation desk and draw. As I don’t have an easy way to linetest traditional animation at home, I just went for it and saw what it looked like once I’d scanned it all in. It’s pretty rough (the jump is dreadful) but it’s adequate for a test! I’ve now finished the Aardman / NFTS Character Animation course … twelve weeks over already! You can find my updated showreel (with lots of animation from the course) here and my new portfolio here. And now for something a little different … we had some free time at the very end of the course so I tried to recreate some of the very poppy Popeye test animation (you can see the original here, at about 2:05). I’d like to try more animation similar to this – with a rig that’s a little more suited to it!